Finger reattachment (or replacement) is defined as reattachment of the part that has been completely amputated. Replantation refers to reattachment of a completely severed part, meaning there is no physical connection between the part that has been cut off and the person. Reattachment can be surgically performed for the finger and such other detached body parts, as the hand or arm. Good candidates for this procedure include persons with thumb or multiple digit amputation . Injury to multiple digits is an important patient selection criterion, since in some cases the least damaged digits may be shifted to the least injured or most useful stump. Patient exclusion is neither clear-cut nor absolute. Generally, severe crushing or avulsing (tearing away) injuries to the fingers may make replantation difficult, but venous grafts may help replace injured blood vessels. Additionally, older persons may have arteriosclerosis that frequently impairs function in blood vessels, especially in small vessels. Special efforts may be made to replant fingers if the person's livelihood (such as professional musical performance) depends on absolute finger control. To increase efficiency, the replantation team splits into two sub-teams. One sub-team in the operating room cleans the amputated finger with sterile solutions, places it on ice, and identifies and tags (with special surgical clips) nerves and blood vessels. Dead or damaged tissue is surgically removed with a procedure called debridement . The emergency room (ER) sub-team will assess the patient during a physical exam with x rays of the injured area, blood analysis, and cardiac (heart) monitoring. The patient is given fluids intravenously (IV), a tetanus injection, and antibiotics . Usually, most finger reattachments are performed with a local anesthetic such as bupivacaine and a nerve block to numb the affected arm. Maintaining a warm body temperature can enhance blood flow to the affected limb. The surgical procedure consists of several stages. The bone in the amputated finger must be shortened and fixed, which means that the bone end is trimmed. After this process, the bone is stabilized with special sutures called K-wires, and fixed pins are placed in the bone after drilling a space to insert them. This process connects the two amputated bone fragments. After bone stabilization and fixation, the extensor and flexor tendons are repaired. This step is vital, since arteries, veins, and nerves should never be surgically connected under tension. Next, the surgeon must repair (suture) cut-off tendons, arteries, veins, and nerves. Healthy arteries and veins are sutured together without tension. A vein graft is used for blood vessels that cannot be reattached. Nerve repair for finger reattachment is not difficult. Since the reattached bone parts are shorter than the original length, nerves can be reattached without tension. A microscope is used for magnified visualization of finger nerves during reattachment. When the severed ends of the nerve cannot be reattached, a primary nerve graft is performed. Finally, it is vital superficial veins on the affected finger (dorsal veins) to cover with a skin flap to prevent death of the venous vessels. The skin over the surgical field is loosely sutured with a few sutures. Any damaged tissue that may die (necrotic tissue) is removed. No tension should be placed on the skin fields during closure of the wound. Wounds are covered with small strips of gauze impregnated with petrolatum. The upper extremity is immobilized, and compression hand dressing and plaster splints are arranged to prevent slipping and movement of the affected arm. The diagnosis is easily made by visual inspection since the finger(s) must be completely detached from the hand. The reattachment procedure is complex and involves the expertise and skill of a highly trained surgeon. There are several important factors necessary to successful replantation, including special instrumentation and transportation of the amputated finger. Surgical loupes (binocular-type eyepieces used by surgeons to magnify small structures during surgery) are necessary for this procedure. Instruments should be at least 3.9 in (10 cm) long to allow for proper positioning in the surgeon's hands. Special clips are used to help suture blood vessels together. The best method of saving and transporting the amputated finger is to wrap it with moistened cloth (Ringer's lactate solution or saline solution) and place it on ice. Generally, the tissues will survive for about six hours without cooling. If the part is cooled, tissue survival time is approximately 12 hours. Fingers have the best outcome for transportation survival, since digits (fingers) do not have a large percentage of muscle tissue. (poor blood and oxygen delivery to the affected area) of the replant. The cause of poor blood circulation must be investigated and corrected, if possible. The patient's room should be warm, and bed rest for two to three days is recommended. Patients must refrain from smoking and take antibiotics for one week after surgery. Follow-up consultations are necessary for continued wound care and rehabilitation. The experienced surgeon can estimate the likelihood complications based on the nature of the injury. Replantations that are risky, such as those with circulatory perfusion problems, have lower success rates. Generally, the most difficult replantations are those that involve children under 10, injuries caused by a ring catching in machinery, and crush-and-tear injuries. 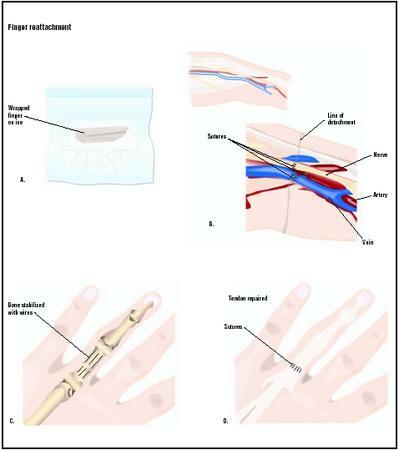 Management of the difficult replant typically includes intravenous heparin to prevent clotting of the blood, and providing a continuous nerve block in either the median or ulnar nerve (depending on which fingers are reattached). A nerve block will cause vasodilatation, or expansion of the blood vessel. Vasodilatation will increase blood flow, bringing with it fresh oxygenated blood. Further evaluation should include checking the patient's dressing for constriction (i.e., if the dressing was placed too snugly and is constricting local blood vessels). Normal results may not seem encouraging. It must be considered that this is a major trauma and a highly complicated and intricate surgical repair. Generally, a normal result usually includes good nerve recovery; approximately 50% of normal for active range of joint motion; cold intolerance (usually reversed in about two years); and acceptable cosmetic results. There are about 10,000 cases of job-related amputations in the United States each year; 94% of these involve fingers. Few statistics are available for the out-come of replantations. The only alternative to this procedure is to lose the finger(s) entirely and manage the remaining hand injury. American Society for Surgery of the Hand. The Hand: Primary Care of Common Problems. New York: Churchill Livingstone, 1990. Green, David P. Operative Hand Surgery, Volume 1, 3rd Edition. New York: Churchill Livingstone, Inc., 1993. Green, David P. Operative Hand Surgery, Volume 2, 3rd Edition. New York: Churchill Livingstone, Inc., 1993. American Association for Hand Surgery. 20 North Michigan Avenue, Suite 700, Chicago, Il 60602. (321) 236-3307; Fax: (312) 782-0553. E-mail: contact@handssurgery.org. http://www.handsurgery.org . "Superficial Fingertip Avulsion." National Center for Emergency Medicine Informatics. [cited June 2003] http://www.ncemi.org/cse/cse1002.htm . "The V-Y Plasty in the Treatment of Fingertip Amputations." American Academy of Family Physicians. [cited June 2003] http://www.aafp.org/afp/20010801/455.html . The procedure is usually performed in a hospital operating room by a microsurgeon, who may be a plastic surgeon with five years of general surgery training, plus two years of plastic surgery training and another one or two years of training in microneurovascular surgery; or an orthopedic surgeon with one year of general surgery training, five years of orthopedic surgery training, and additional years in micro-surgery training. Are there any special precautions I should take with my pain medication? How should I care for the wound? When will I regain feeling and function in the affected finger(s)? Will I need physical therapy for the injury? How much function can I expect to regain? my top portion of fore finger about one third of it got amputed doctors said that reattachement is not possible . now what are the ways to get complete finger by attaching artificial part to it ,so that it is permenent with maxmimum degree of freedom to that finger movements. I had four fingers on my right hand cut off about 20 years ago. The index middle and ring fingers were re-attached during a 23 hour surgery. The ring finger had to be amputated about a week later due to poor circulation. The middle finger has a plastic knuckle due to deterioration of the real knuckle. All in all I have excellent use of the hand however. Using a miter saw I amputated all 4 fingers (across my middle knuckles) on my left hand, and somehow also amputated my left thumbnail... I felt nothing at the time, but looked up to see my 4 fingers and thumbnail around the saw with just a little skin around the thumbnail. I RARELY us saws to this day... That day will forever be burned into my memory July 21, 1995...right around 9:30 AM. If anybody is looking for a hand surgeon i would MOST DEFINATELY recommend Dr. David Zehr at Baylor University Medical Center in Dallas, TX. I'm now 27 years old and own my own design firm working as an architectural designer. I produce custom residential and commercial construction drawings & provide all my clients with their own personal web page and 3D views of their project as it progresses... my point being, I sit at a computer using my keyboard and mouse at least 85% of the day and the reattachment Dr. Zehr did has made the nature of my business and the life i live today normal. I don't even notice anymore that i have a had that's not normal. I had pretty bad post traumatic stress after the incident, but have solved that problem using medication. I owe him my life as it is today and if you are looking for a hand surgeon, look no further. I haven't talked to or seen him in about 14 years now and after i stumbled on this page i am definitely going to contact him and tell him how much i appreciate the life i feel like i would not have, had i not had a doctor with the knowledge to successfully reattach everything but a small portion of my "pinky"....even my thumbnail. Sorry if i rambled, but I truly feel like he changed my life and made good out of a bad situation. I severed my index finger (cleaver across the flesh between middle and thumb) and took out the knuckle. I had a replant. Cosmetically it looks fine. But be sure you understand the time involved in the rehabilitation, the expected use you are to get from the final digit and the amount of discomfort you should expect for the remainder of your life. Please help me with advice on post operative care and what to expect. Four days ago, the thumb of my dominant hand was severed between the nail and the top joint. It was reattached at St. Mary's Hospital, San Francisco by Dr. Charles Lee in a two-hour operation. Several nerves and blood vessels were reattached but the tendons are left to be repaired later. The reattached tip is stabilized with two pins that stick out from the top with a 0.8cm length of crushed bone left in place for the body to heal. The blood supply and sensation of the fingertip when scratched appear to be normal. I did not have much pain and am not on pain medication. What should I watch out for in the next weeks and what can I expect going forward? I was wondering about my grandson. (11 Months old.) He had to have two of his little fingers attached agan after an accident at home. since then the drs. says that he will have to have his little fingers buried inside the palm of his hand in order for his nails to grow back . is this a succeesful surgury. have this kind of surgury been done before? I would like to know more about this. thank so much. his mom and Dad are very concerned about this. the surgury is supposed to take place in REd Deer AB.how is this all done? need to know all the instruments used for reattachment of finger for my class project. This article is really educative.I would like to ask some questions on where can i find a qualified surgeon? my brother cut his first finger on the left had , can a surgeon reattach a plastic finger in the future? I work at a bank and about 3 weeks ago, the vault door shut on my fingers. It's not just any door either, it's 5 tons of steel and concrete, so obviously the damage was pretty extensive. It did not completely amputate my fingers but partially amputated 3 of them. The bones in my index and middle finger were completely crushed and the sin was badly torn so both of the were dangling off. The middle finger was handing on by a tendon and some nerves and the index finger was hanging on by some skin and the main artery. The skin was torn on my ring finger but the bones weren't broken and my pinky nail was ripped off. The doctors weren't sure if the could save my middle finger because my main artery was severed and it was very pale. Anyways, after8 hours of surgery, they managed to reattach everything and I should have nearly full function in about a year. It's truly amazing what they can do. If all of the skin has been torn off and the nerves are also gone and the only thing left is the bones of the finger, does the finger have to be amputated? My two year old lost a finger. Is there room for reattachment in the future. My trigger finger was amputated when I was 4 yrs old. I am emotionally disturbed with this finger and want to replant it. Can u please give any advice or comments to make my dream come true. How much it cost and what should I do? Em 22 yrs old and my right index finger tip got amptuted.now its stiched but the finger is short.is there any chances of reconstructing it to its original length. just had finger reattachment 2 days ago. will the pain ever go away? My 3 yrs son cutoff his index finger 6 days ago.it is striched by normal seargon with in 45 min what are the chances of reataichement of finger.pls reply urgently. My 14 yrs son cutoff his index finger 6 days ago our plastick sergen tried to repalant but fail .can i replant his finger in future. Ben: Dr. Zehr did my daughters surgery when she was in a UHaul accident in 2000. We are from AR, and were told by every surgeon consulted that her fingers would have to be amputated. Finally the hospital called Dr. Zehr who agreed to try to save her fingers if we got there quickly..We med flighted to Dallas, and Dr. Zehr created a miracle. HE is a HERO in our eyes. It saddens me to think what my daughters life would have been like if we wouldn't have found our way to Dr. Zehr. You really should contact him and let him know how he impacted your life..we certainly have! Hi, I am saisudha. My 2 year old son had an accident at home on 6th Aug 2012, and unfortunatley his left hand ring finger upper one inch got cut off and seperated from the hand. we took him to the royal victoria hospital, newcastle, uk immedietely and doctors did some surgery to attach the part. They said that they have done their best and the chances of success rate is 50 - 50 . Could you please let me know the success chances. I had my right index finger was crushed and basically amputated. The finger was still attached. The blood vessels, nerves and tendons were severed. I had surgery 2 years ago and my finger was successfully repaired. I have about 70% regained motion. I do have the intolerance of cold and one of the blood vessels was not abled to be saved. My question is my finger is still numb in places and I still have daily pain in the finger. Does the pain ever go away. I am very luckey and thankful that I still have my finger. I would still like to get more range of motion, less pain. A medical professional said I should seek a hand surgeon and get another opinion and surgery...I worry that this might do irrepairable damage. I had the tip of my thumb amputated a year ago and it was reattached. Since the cut went through the nail bed i was told the nail would not grow past that point. I has grown past and is still numb and painfull at times. There is a little redness under the nail at the tip. I would like to know if this is normal and will it ever get any better. Can we transplant Finger vein from one person to another person? And also i need know the unique feature about the Veins. i have more information about surgery of amputaion injury. where is u are hospital? I'm 13 years old & turning 14 this year. 6 years ago when I was 7 my left hand ring finger was blown off my a firecracker. Can I get a finger reatatched, since it has been 6 going on 7 years ? my left hand thumb is damaged on an accident and doctor was cut it due to infection. i want to know can we attach a artificial thumb? My left hands two fingers are removed by doctors because of that fingers were totaly burnt by electrical shock at farm so doctors removed my finger to avoid infection. Is there my fingers can reattach or replant? My right hand 2nd finger have cut,plz advise how will attached my finger in BD. I got my Index finger of right hand cut from first knuckle when inspecting belt tension. Now I have 2/3rd of Rt hand finger. How can my right hand finger get attached for completion. I am really upset. my nephew who is just 3 years old has lost all his fingers while lighting a cracker is there any way or treatment possible to replace his fingers ?? said that reattachement is not possible. What are the ways to get complete finger by attaching artificial part to it ,so that it is permenent? My 2 year old son had the tip of his ring finger re-attached and his pinky finger bone cut back a bit so they could cover it. Is there still a chance to grow nail on the pinky? I think the nail bed was removed in the accident. I had my thumb cut off by a table saw in between the first the second joint 3 years ago .. Had it reattached.. the joint degenerated ,lack of blood flow, and sever cold intolerance . Im thinking of having it removed because i cant enjoy the outside when its only 65 degrees outside .. I really would love to keep my thumb, but dont know if i would regret it . Is there anything else i can do ? or can i get advice on similar cases. hi. i'm sugumar. 25years old. last sat my forefinger, middle finger , ring fingers tip upto first bend cut in my left hand. i took my cutted finger to hospital . kept my cutted finger in ice. they took treatment after 3 hours. finally they said they can't rejoin the finger, because cells dead in that part and no blood circulation and damage in that part. i close it i didn't rejoin. now what i want to do. can i come back from it. tel any treatment or suggestions . I lost my left hand ring finger 7 years ago when i lit a fire cracker. it blew it off so now i have about and inch left. can a finger be reattached to it ? even if its not actually mine ? My ring finger of the left hand was cut-off from the nail area upwards in a bus accident. I am wondering if it is possible to get a replant of the same and where. If not is it possible to get a plastic extension of the same to enable me resume playing the keyboard and guitar? My father had met with an accident 2 months back and lost his left hands fingers which were badly crushed by bus. Now he is recovering his hand after the skin grafting. kindly let me know any options of reattachment of artificial fingers possible in india. I CUT OFF MY FINGER CHECKING A BELT IN TRUCK AND SAT IN EMER. RM. FOR 6 HRS BEFORE OP. COULD THIS BE WHY I NEED IT CUT OFF 6 WEEKS LATER ? one month ago i have lost my right leg toe finger while working in a machine. Now i am looking for the artificial finger replacement.where should go in india to get this service? one month ago I have lost my right leg small finger an accident.my age is 25 years old. can a surgeon reattach plastic surgery finger in the future. please help me. My left hand thumb cutoff by 0.5cm just from the neil stumb joint,two months ago with bike chain, when reached to the hospital doctor refused to atteched. Iam 25years old from sikkim india, and hearty looking for plastic surgery or grafting or any mean of reatteched, please help me with your suggestion, since i dont have any idea regarding medical info. Please suggest. My left hand thumb finger is cut,nearly root part of nail. I lost completely nail part. there is no damage for bone is there any possibility to re attach, it was happen on dec 24th 2014, i think now slightly nail start growing. please suggest me in best way because it is my permanent writing hand still my birth. sir one month 23 day's ago my left hand middle finger is cut,so nearly root part of nail's lost completely nail part.so there is damage for bone is there any possibility to re attach,it was happen on 1st January 2015 I think now slightly nail up start growing and I already born operation my finger.so request please suggest me in best way because it is my permanent writting hand still birth so please please sir. my right hand half thumb is cut an accident 10 year ago.I want to know can we attach a artificial thumb? I was born without a thumb on my left hand. I have always wondered if there would be a way too attach a robotic thumb into my left hand. If anyone has an answer it would be greatly helpful. i lost my right leg toe finger completely.i met with an accident and due to some infection the doctors removed the finger up to the larger extent below the finger also.Now any reattachment is possible.if yes please kindly tell me the detalis how it can be treated and where. My one finger of right hand cut from upper first joint I want to complete that.so pls let me know to complete that. sir, my name subbu 15 months ago my left hand middle finger is broken in middle of finger due to playing cricket , i consult so many doctors but any body dont recover the broken, my finger is bent side way lightly approx 2-5 degrees. Now i can recover my finger please give me a suggestion. My brother just had surgery on his fingers,due to an accident he had at work were he crushed his fingers and attached by skin only he had to get his fingers screwed and pined together it's been 3 days since surgery but the fingers look purple or blackish is there a possibility that he'll loose his fingers? I am wondering how long it will take for a finger tip that was amputated and then put back on take to heal. The bone was cut at an angle, (like this /). I have a needle in it to hold the bone in place. I am experiencing (bee stinging) in the tip. Is this normal? I wish I could send you a picture of what happened so you can see it. I guess my question is, how long will it take for the bone to heal? And will I ever get normal feeling back in my finger. i am 25..when i was 8 my right foot second finger injured..Now it's look like small..I want to regrow my finger as normal..pls give a solution pls..
Hi, I am krishnakumar and my father lost his left hand thumb on an accident.He lost the vein which is attached to the finger,is that possible to re attach the thumb ? age 13 left foot fourth finger torn completely detached artificial finger attachment possible? I am 27 years have lost my thumb and index finger in cracker blast 15 days ago, my thump metacarpal has been removed completely is there any surgery possible to implant new thumb and index finger other than toe to thumb transplant. I would also want to know about taking prosthesis parts are the reliable. My little daughter has cut and removed her Interphalangeal from her left hand and it doesn't looking good. at yet she is 6year of age kindly suggest me what is the solution for her can i transplant and is there any other solution. I severed the top part of my pinky finger at work 3 days ago. I crushed it between the open part of a pipe and a concrete weigh, cutting it at an angle, just above the third knuckle, removing about a centimetre to 2 centimetres of my finger. The emergency room doctor removed all of the bone from the top portion of my finger and cut down some of the bone in the rest of my pinky that was still attached, and sewed them together. I have no nail on that finger now, very little bone above the joint, and it looks like my body might be regecting the top part of my finger, but it's too early to tell. I play guitar, and I'd like to think I play guitar really well. I am near f***ing petrified that I'll never be able to play again. I have no question or anything, I just need to get out my feelings. The pain was nothing, I don't care what it looks like, and if I never feel with the top of my finger again, I don't care. The only that scares me, that truly, truly scares me, to f***ing tears is that I'll never be able to play guitar again, that I won't be able to do what I love to do. I played just about every day, and I took that for granted. I haven't played guitar in 4 days now and I'm crying my eyes out because I'm so scared I'll never play again. I don't even know if the top of my finger will stay at this point. I just want to play guitar again. All I want is to play guitar again. Index and middle finger of right hand of my nephew has cut down completely. May be replanted live finger of other person or artificial finger will be added. He is only 8 yrs old. Please reply forthwith. My son is 2 month old. He was born without finger on the left leg. We did scan and found all five fingers and toe have only one-one bone. The baby is normal and hands and right leg are good. Only left leg fingers could not be grown. The Foot soles of left leg is in good condition. Could you please advise me what to do. Is there any possibility for transplant or reconstructive surgery is enough. What is the total expenditure on the reattachment of fingers of both hands? My left hand index finger got crash in machine so doc decided to remove finger completely so for further any sugestion to fix. my brother had amputation of index and thumb 3 years back..is there any surgery to get back finger..plz let me know..
my toe middle finger is been swollen and cut off, is there any surgery to get back my finger... please let me know. I manage to take the end of my right index finger off just below the nail with an axe. It was literally hanging by a small thread of tissue. I put it back in place and it was sewn back on within 3 hours. 2 weeks down the line I have no pain and the soft tissues have heal and sutures out. I have good blood flow and some numbness on the finger tip. I am hoping the distil end of the bone will heal in the next few weeks. Currently I have it in a "mallet splint". I have been warned if there is a non-union of fracture It may need to be pinned in the future to reduce pain. sir I lost my left hand index and middle fingers for Road accident any possible reattache the lost fingers. Hi, A friend of mine lost 3 fingers. They were accidentally cut. Is it possible to replace them with artificial fingers? My own brother's index fingertip was accidentally cut in this morning. The local doctor said it cant be reattached. May i know is there any artificial thing to replace that amputated tip? MY 31 yr. old lost his 4 fingers on his right hand in a table saw accident in Nov. this year. They were able to reattach his pinky and part of the middle finger (although it has no nail and appears pretty mangled. He is missing the tips of his index and ring finger down to the middle between the first and second joint. His thumb is fine and so including it and the reattached pinky he has 2 fingernails on this hand. He is right handed and an artist! So at this point it is day by day. I would appreciate any advice or encouragement I could use to help him. We are all still pretty devastated. I live in Florida, he is in Canada. I keep wondering what more can be done for him? He has had a very difficult time with pain control also. He appears to be maintaining a pretty good attitude, but really, who can know for sure? Don't quite know what to do for him. Wish it was me instead of him. I have a question If someone has no proper fingers by birth can it be attached with any surgery? Actually My Cousin Hijrat Shinwari lost Right hand thumb a few days ago would please give information about thumb finger re attachments plastic surgery or donate from other ways. I am 36 year old my middle finger is been swollen and cut off, is there any surgery to get back my finger... please let me know.